​These branded red & yellow tour buses can be identified all over the world! What's great about these tour buses is that if you're visiting a city you will uncover all the hot spots in town. City-Sightseeing Worldwide is known for their hop-on-hop-off tours, meaning that you don't just get to see the best places but you get to experience them by hopping off the bus, exploring a hot spot & later re-joining the tour whenever you are ready. It's a guaranteed way of knowing you'll have the best experience at your visiting city's top spots v.s figuring everything out all on your own and landing on a hit-or-miss. ​TopView Sightseeing tours are created by local experts who know the ins and the outs of Brooklyn, Manhattan, and The Bronx. Their bus tours are well crafted to ensure you get to experience the diverse and complex city of New York. We are super excited to partner with Experiencias Xcaret Mexico to bring you some of the best Mexico has to offer in entertainment! 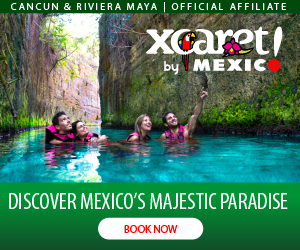 Xcaret is a huge, widely popular known park located in Playa del Carmen and Cancun, Mexico. Xcaret offers a series of tours and excursions throughout their park, each catering to different forms of exploration. Feeling daring & bold? Take a visit through Xavage where you can kayak and go off-roading. Seeking a high-energy thrill? Xplor offers zip-lining through Riviera Maya, underground river swims, & under earth driving! Click on "Xplor" (above) to save 15% when you book online. Xplor Fuego is all about exploring fire illuminated cave trails, under the stars zip-lining, nighttime rain forest drives, & underground night river swims. And that's just the beginning, Xenotes Tour allows you to rappel, zip-line, kayak & swim in 4 different types of underground water holes & include a jungle picnic with wine & beer! Most tours come with food & drinks included!